In the heart of Florence, a congress and exhibition area that is unique in the world. Just a few steps from the main Florence railway station of Santa Maria Novella and only 5 km from the International Airport Amerigo Vespucci, Florence offers a congress center of the highest level: three structures integrated into a single complex, capable of satisfying any and all types of requirements. The three structures are Fortezza da Basso, the Palazzo dei Congressi and the Palazzo degli Affari and this is call the Cittadella of Florence Conference. 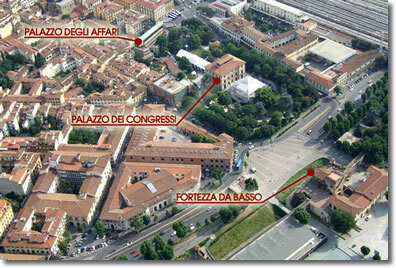 The three structures that make up the congress area, Fortezza da Basso, the Palazzo dei Congressi and the Palazzo degli Affari, are located next to each other and are connected by pedestrian pathways; the congress area forms a single standardised complex equipped with 40 halls, which is perfectly integrated into the fabric of the city. It is the regular host to large-scale congresses in the medical and scientific field. Fortezza da Basso, with an area of almost 100,000 square metres surrounded by walls dating from the 1500s, is the ideal setting for large-scale events that expect a high level of participation. On its own, it is capable of hosting congress events with up to 12,000 participants. This modern and technologically efficient structure is capable of assuring great ease of functionality and security, large communal spaces, as well as pedestrian connections to the other structures in the Florence Congress Center. The Palazzo dei Congressi, with the 18 rooms of Villa Vittoria, an historical residence dating from the 19th century, is suitable for sessions and meetings of the media and those of small dimensions. It alternates between rooms that are finely decorated in the antique fashion and modern and highly functional structures, such as the beautiful Auditorium, with a capacity of 1,000 participants. The modern Palazzo degli Affari, with its multipurpose and flexible structure spread out over five floors, has an overall capacity of 1,500 people in seven rooms. Participants particularly appreciate the fact that the congress site is so close to the historical centre of Florence, which allows them the possibility to combine their congress experience with a stay in one of the most famous cities in the world. In order to reach the congress center from Piazza del Duomo, in the centre of Rennaissance Florence, it takes just ten minutes by foot. Florence has always been considered the congress city per excellence and one of its many advantages is its hotel capacity, with an impressive variety of top quality choices. Most of the hotels used to host congress visitors are located at a distance of less than one kilometre from the Florence Congress Center itself. The Congress can thus be reached in a few minutes by foot, passing through the historical centre of Florence, which is unrivalled throughout the world. The hotels in the city centre are very often located within prestigious historical palaces, while in the immediate periphery there are modern and functional structures with a very high number of rooms available. The city of Florence welcomes congress participants with its Congress Card, which allows free usage of urban public transportation services and the shuttle to and from the airports of Florence and Pisa. The visual impact from outside the complex of structures in the Florence Congress Centre is stunning and stems from the interaction of three elements: the Fortezza da Basso, the Palazzo dei Congressi and the Palazzo degli Affari. The overall complex is located right beside the historical centre of the city and occupies an area of approximately 100,000 square metres. Within this area, some 65,000 sq metres are covered, divided into three main structures with functional, multi-purpose spaces; the remainder is covered with gardens. The congress mini-city can host events with up to 20,000 participants. 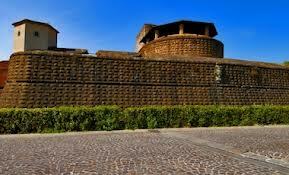 The immense military structure of the Fortezza da Basso, with its stunning appearance, has been the heart of numerous large-scale scientific events. Its overall capacity reaches 10,000 seats and is unbeatable in terms of flexibility, thanks to its large modular pavilions. 8 minor halls ranging from 30 to 150 seats. Why the city of Florence? Ease of access: The Fifth Congress of the WUWHS should be located at a point that is equidistant from the extreme geographical poles from whence arrived the majority of the participants to the previous editions. Italy guarantees easy and rapid connections with the entire world. Italy is central to both Eastern and Western Europe and is also a barycenter for Asia and America, thus travel times are kept to a minimum for the largest number possible of participants coming from all over the world. In effect, the travel times required to reach Italy are significantly shorter for the majority of participants when compared to other locations. This chart details the average flight times required for participants coming from the various continents. International character and hotel availability: Florence has always been home to countless numbers of foreigners. As proof of its ease of access and the international nature of its culture, every year it is visited by approximately 3,000,000 people and reaches 7 million in terms of presences. The majority of tourists come from the United States, South America, France, Great Britain, Germany and Japan. Florence, the second capital of Italy, boasts 879 hotels with 18,200 rooms; of these hotels, 12 are 5-star, 82 are 4-star and 142 are 3-star. Over 5,000 rooms of the highest quality are located in a one-kilometre radius around the congress centre. Climate: July and August are the hot months in Florence. Towards the middle of September the climate cools down and becomes very pleasant, with evening temperatures of around 23° - 24°C. Florence is connected to the entire world through its international airport “Amerigo Vespucci”, as well as the international airport of Pisa, “Galileo Galilei” (45 minutes away). Florence airport has direct flights to and from 17 European cities and is served by 25 airlines. The routes supported by Florence airport with numerous flights link it to some of the most important European cities, as well as other vital tourist and commercial sites. Florence can be reached directly from: Amsterdam, Barcelona, Brussels, Krakow, Dusseldorf, Frankfurt, Geneva, Lyons, London, Madrid, Munich, Paris, Stuttgart, Timisoara, Vienna, Tirane and Zurich. Within Italy itself, there are direct flights to and from Rome (4 flights daily), Cagliari, Catania and Olbia. Pisa airport is served by 18 airlines with over 70 routes to Europe and the United States; the shuttle bus from Pisa to Florence (approx. 45 mins) is free and offered by the City of Florence to all congress participants. Florence and Rome are conveniently linked by a high-velocity train which takes just one hour and 15 minutes to reach its destination, with trains leaving every half hour. Florence is one of the major tourist sites in the world: the historical centre, its museums and medieval / Renaissance monuments are famous worldwide. 24 hours in Florence? The city is worth rather more, but you can at least get some idea of it. With a single day at your disposal you will want to see the chief monuments and walk around the “heart” of the city centre.